Warren, Michigan - Auto workers picket a Chrysler stamping plant to protest a new work schedule that they say undermines the eight-hour day and disrupts family life. The workers are upset that United Auto Workers leaders are allowing the auto companies to schedule 10-hour shifts and Saturday work without overtime pay. Officials referred to on the poster are UAW President Bob King and Vice President General Holiefield. 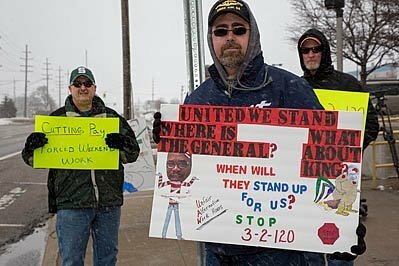 Image Description: Warren, Michigan - Auto workers picket a Chrysler stamping plant to protest a new work schedule that they say undermines the eight-hour day and disrupts family life. The workers are upset that United Auto Workers leaders are allowing the auto companies to schedule 10-hour shifts and Saturday work without overtime pay. Officials referred to on the poster are UAW President Bob King and Vice President General Holiefield.